Rolls-Royce, a name that transcends the confines of motoring to become synonymous with ‘the best of…’ any type of product or service. Just five years after its first cars were produced 1906, Rolls-Royce immodestly described itself as builders of ‘The Best Car in the World’ in its advertising materials. A manufacturer’s PR spin is one thing but when did it enter the consciousness of the general public to begin to recognise Rolls-Royce as a symbol of ultimate finery? 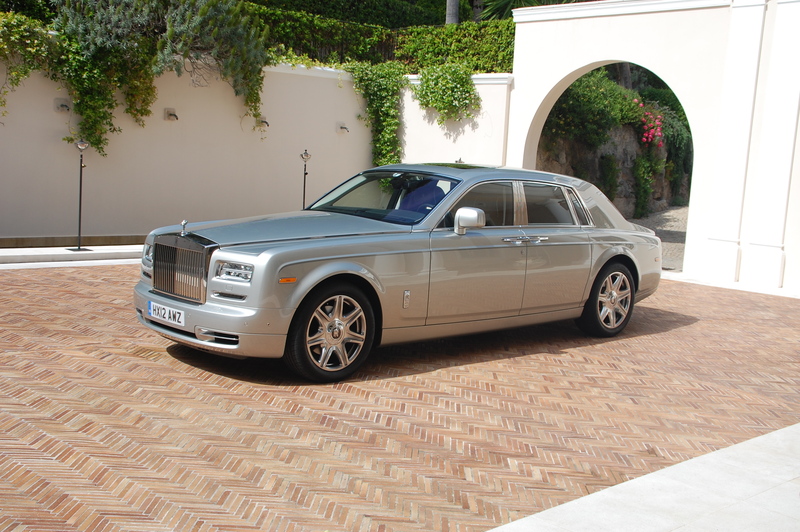 Rolls-Royce Phantom Series II – Best Car in the World? Charlie Chaplin’s back catalogue might initially sound like an unlikely source of confirmation (and it may well not be the earliest example caught on film) but his 1931 classic City Lights provides a definite example of Rolls-Royce’s luxury status. If you’re not familiar with City Lights, firstly you really ought to redress this element of lacking in your life as soon as possible. Secondly, it helps to know it was Chaplin’s last silent film and was released at a time when ‘talkies’ were rapidly growing in popularity. Although there was an accompanying musical score and various sound effects, the strength of the visual imagery was of paramount importance to convey an unambiguous understanding of emotions and reference points to the viewer. The joke, beyond the slapstick element of Chaplin’s a tramp kicking another down-on-his-luck chap out of the way to grab the last few draws on an expensive cigar, is that to all intents and purposes, Chaplin appears to be the epitome of wealth. How so? He’s wearing expensive attire, although it’s ill-fitting, so it can’t be that. No, the clinching element that represents affluence is the car. The humour of the scene can only work on all its levels because a Rolls-Royce was understood to symbolise opulence. 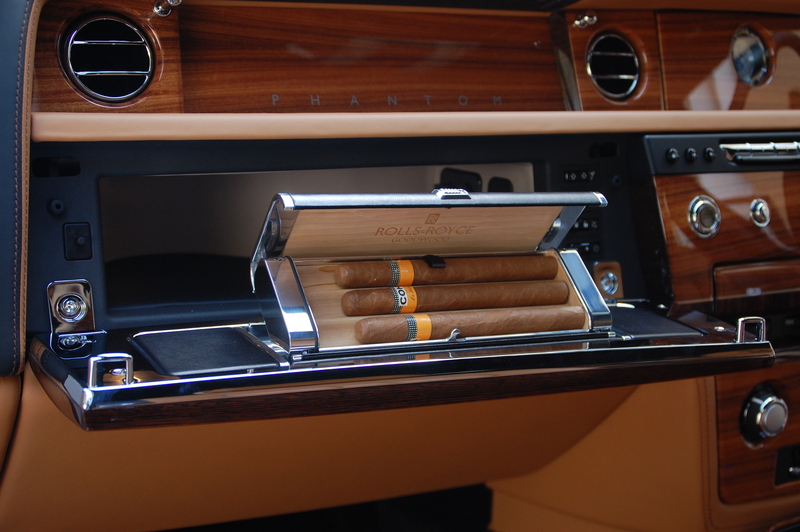 Personal parallels with Chaplin’s tramp were not lost on me as I travelled in a Rolls-Royce, wearing an ill-fitting suit and enjoying expensive cigars at the first drive experience of the recently unveiled Phantom Series II. The befitting location wasn’t an American metropolis but instead the stunning surroundings of la Côte d’Azur, playground of the hyper-rich and famous. How has the Phantom evolved into Series II? The changes to the Phantom Series II are certainly not of blink-and-you’ll-miss-them variety but they are subtle and deliberately so. Rolls-Royce is particularly astute at ensuring its customers feel valued and respected; Phantom owners know what they like about their cars and therefore changes mustn’t make their Series I models look particularly out of vogue. 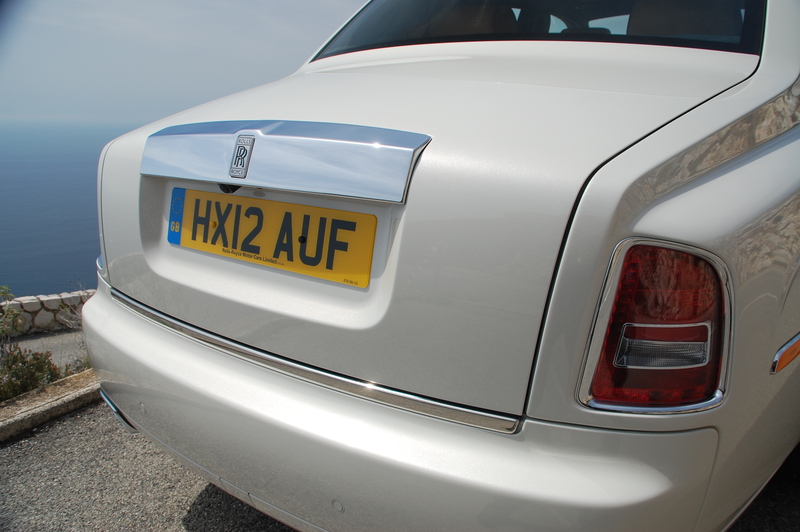 Changes, therefore, are there to benefit and improve upon the Phantom Series II experience, not merely a facelift for the sake of facelifting. Different is not permitted, but better is. So what’s better? Walking around the outside of the Phantom Series II is akin to perusing the architectural grace and nuances of a stately home. There is so much of the car that it’s impossible to appreciate all its facets in one viewing. This was my second time of being up close and personal with a Series II saloon and its majesty was particularly radiant in the glowing natural daylight of the South of France. Starting at the monolithic rear, gentle modifications have been made to the bumper moulding which is now raised in profile making the Phantom’s tail appear visually lighter now that it’s not so close to the ground. Where it meets the boot lid, the new look is less fussy, promoting elegance and exquisite detailing, with a chrome finisher just below the opening. Familiarise yourself with the window line and you might be tricked into thinking it has been extended but this sleight of hand is the result of an elongation of the chrome finisher at the end of the glass house. Now the lower edge extends further towards the back of the car, being of a similar angle to the rear screen. It’s a graceful solution to something that wasn’t especially problematic before, but now that it’s installed you instantly welcome its inclusion. Wheel designs are curious in that they can work brilliantly whilst in isolation but combine them with a car and they make or break the design. Three new wheel designs have been introduced for Phantom Series II, none of which looked inelegant but personal preference will dictate which one suits your tastes. The purposeful, thick-spoked variety look great but I prefer the polished discs with vent holes around the circumference; more in keeping with the sheer and unsullied elegance of the body sides. The Phantom Series II’s face has seen the most significant of changes, with all Phantom body styles having their lower-set circular driving lamps replaced with an LED slither in a rectangular formation. The look mimics the smaller Ghost series and from some angles even bears hallmarks of the Silver Spirit line, the marque’s mainstay throughout the 1980s and 90s. LED technology provides brilliant illumination for night time driving, the light beams actively changing their beam pattern depending upon speed and steering wheel angle to aid high speed cornering, something particularly useful through the tunnels and hairpin bends of this corner of Europe. 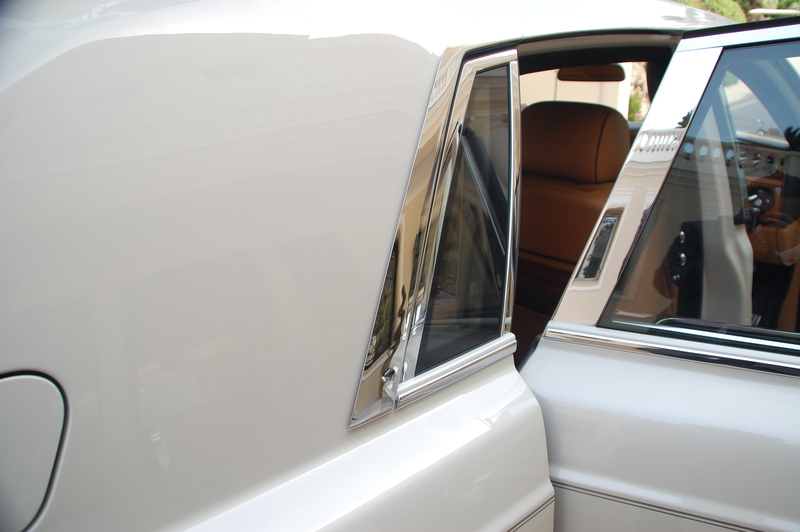 Saloon Phantoms continue with a fully exposed traditional grille and surround; the two-door models still employing a more enclosed and reclined example. With both the side doors open together, the stately home analogy continues as the experience feels not unlike the double doors opening to a grand entrance hall. Series II Phantoms are laden with technology that Rolls-Royce believes its customers actually need and use, rather than simply ticking off every option from the BMW innovations inventory. 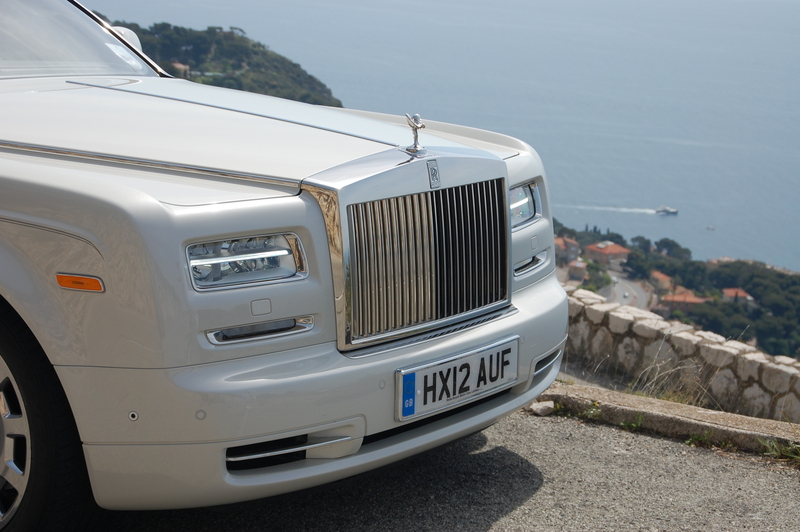 Contemporary technology, like the 360 degree camera system, sit alongside more traditional Rolls-Royce fittings. Being a Rolls-Royce, whilst the technology is present, it isn’t brashly illuminating your peripheral vision, vying for attention but instead remains hidden until required. 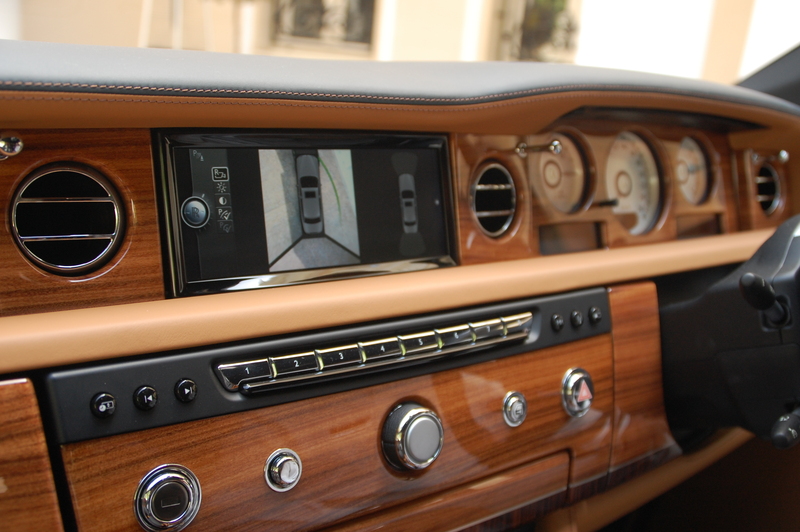 The single largest change to the interior features is the wider, sharper and more functional infotainment screen, which still revolves away behind a veneered plinth housing an analogue clock. The latest satnav system is much more contemporary and easier to use, controlled by a rotary controller that itself can be hidden away too. As well as enhanced navigation features the screen also serves as the display for the incredible Harman Kardon audio system and the new 360° camera system ensuring parking your near 6m long Phantom is effortless as positioning a MINI. 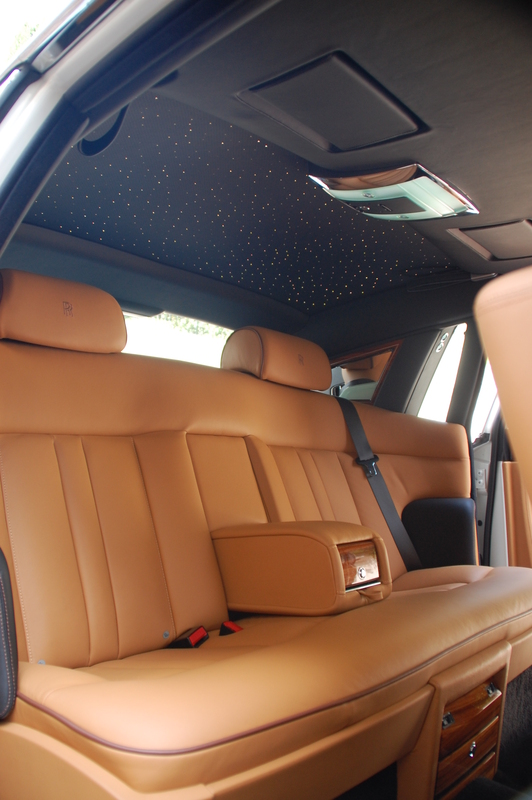 But the rear seats are what the Phantom Series II saloon is all about, the majority of owners preferring to be chauffeured from one important meeting to the next, rather than taking the wheel themselves. Magnificence is omnipresent. The finest wood veneers, the most wonderful of leathers and the deepest of carpets ensure that no matter what parts of your body are experiencing the Phantom, the sensations amplify what your eyes are enjoying. Above, the saloon is now available with the starlight roof lining, previously a feature of the Coupe, while hidden behind those high gloss picnic tables on the seatbacks in front of you are large TFT screens on which to watch television, or control the onboard entertainment system. The deep, fluffy rugs are so sumptuous their deep pile warrants their own system of pile measurement. It’s almost criminal to wear shoes inside the Phantom, so all the better to slip them off and sink your toes deeply into textured decadence. Unsurprisingly, less than 10% of Phantoms leave the Goodwood factory without some kind of modification and Rolls-Royce’s bespoke team is inundated with personal requests for special fittings. Evidently with some of the examples of tailored requests on display, personal wealth doesn’t directly correlate with taste. What isn’t in doubt though is the depth of quality of the craftsmanship involved. A test drive from the back seat? I’ve not taken leave of my senses and will be testing a Drophead Coupe example of the Phantom from the driver’s seat in a few weeks time, but here was a unique opportunity to explore the ride comfort and refinement of the Series II saloon from the back seat. Rolls-Royce officials on hand were keen to describe the experience as magic carpet like but this metaphor only hints at part of the story. Seemingly regardless of the state of disrepair of the road surfaces travelled upon, the Phantom Series II wafts along with absolute serenity. The experience borders upon being eerie in so much as you know the road is beneath you but you feel isolated from it as though journeying on a cushion of air in a high-class hovercraft. Yet, incongruously, the Phantom remains planted, never suggesting it’s going to list around bends where the approach speed is north of 10mph. At no point does it feel as though its hull is on the brink of lunging, lolloping or in any other way remotely losing a modicum of its composure. 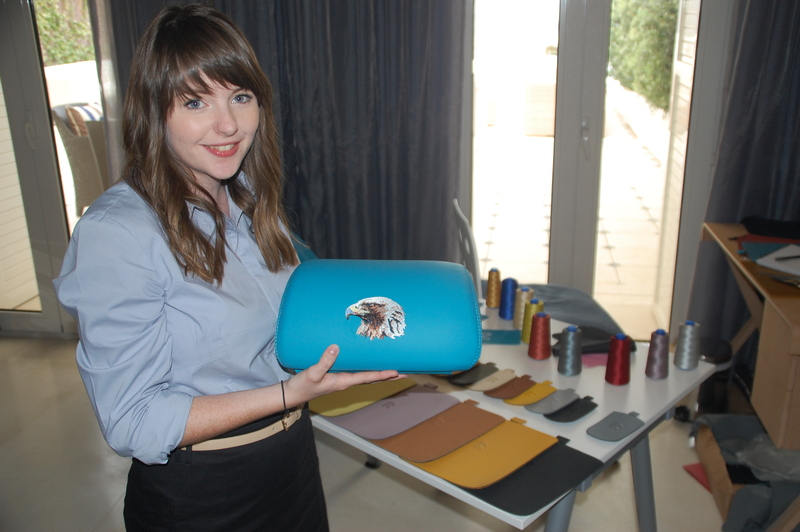 Forget the carpet aspect, the Phantom Series II experience is simply magical. Enter the domain of the Phantom Series II and you’re ensconcing yourself in a world of hyper-extravagance, where you want the experience to be endless; to perpetually lap this sceptred isle in the lap of luxury. The levels of quality, craftsmanship, attention to detail and that unmatchable ability to make you feel utterly special help to justify the price tag that will gracefully sail north of £300,000 once you’ve made it your own with bespoke tailoring. Rolls-Royce doesn’t advertise its cars in the conventional sense and hasn’t for many decades but if it did, would it be justified to resurrect its ‘Best Car in the World’ strapline? It’s almost impossible to say, because to determine the best, then every other car must also be sampled. 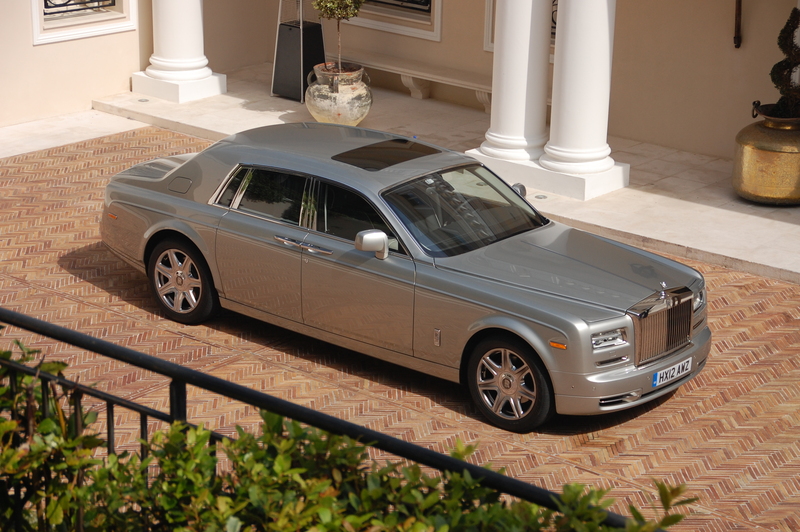 One thing is abundantly clear though – the Phantom Series II is the Rolls-Royce of Rolls-Royces. Thumbs Up: A symbol of luxury that requires no explanation, unparalleled levels of opulence, nothing else makes you feel this special. Thumbs Down: Indiscreet, enormity of physical size, thirst and price.